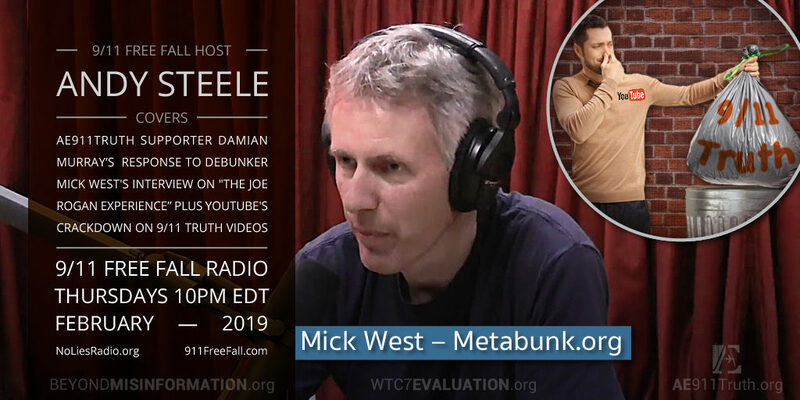 9/11 Free Fall 4/25/19: Craig Mckee on media, censorship, and Omar controversy. Host Andy Steele is joined by journalist Craig Mckee. 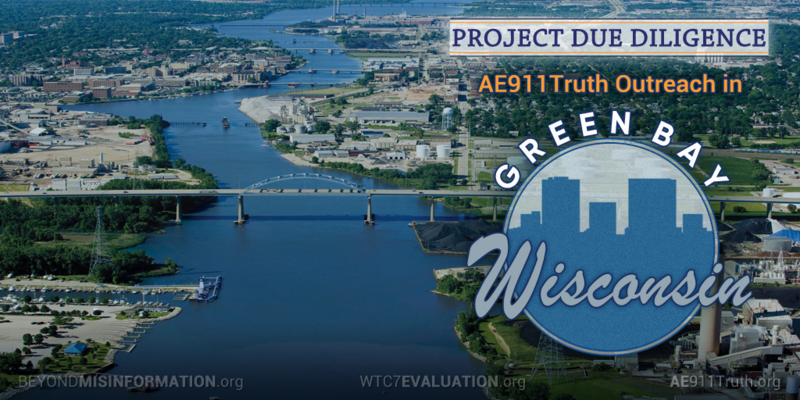 In this discussion they talk about recent news stories put out by AE911Truth. Among the topics covered in this interview is Courthouse News pulling its article that reported the recent lawsuit filed against the FBI for withholding critical 9/11 evidence from its 2015 report to Congress, and the contrived controversy surrounding Congresswoman Ilhan Omar and her comments about 9/11. 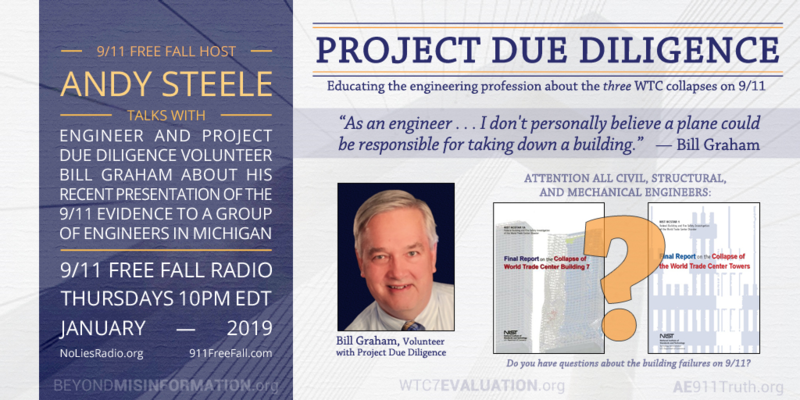 Host Andy Steele is joined by structural engineer Fred Schaejbe and civil engineer Dan May who, as volunteers with Project Due Diligence, recently gave a public presentation of the WTC evidence in Wisconsin. 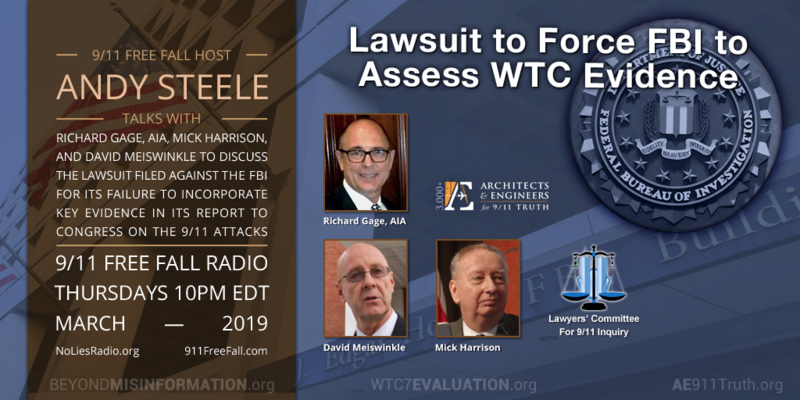 Host Andy Steele is joined by 9/11 family members Bob McIlvaine and Barbara Krukowski-Rastelli, who discuss their lawsuit against the FBI over the Bureau’s failure to include key evidence it knew of in its 2015 report to Congress. The two parents, along with the Lawyers’ Committee for 9/11 Inquiry and AE911Truth, aim to compel the FBI to reconstitute its 9/11 Review Commission and issue a new report that assesses all of the evidence the FBI is accused of omitting — including evidence of the World Trade Center’s explosive demolition. 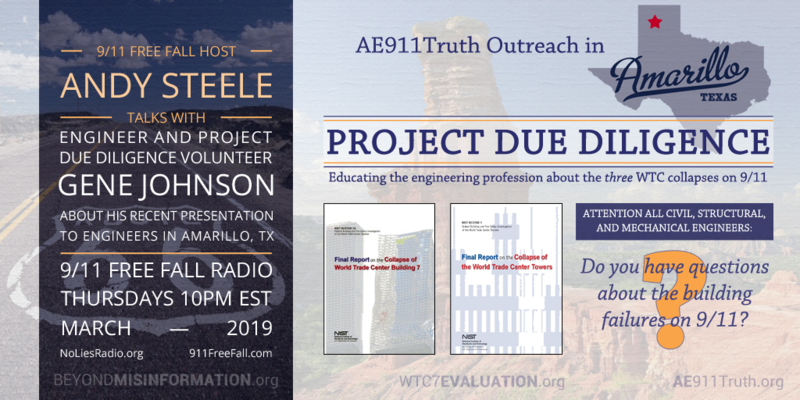 Host Andy Steele is joined by engineer and Project Due Diligence volunteer Gene Johnson, who discusses the presentation of the WTC evidence that he recently held in Amarillo, TX. 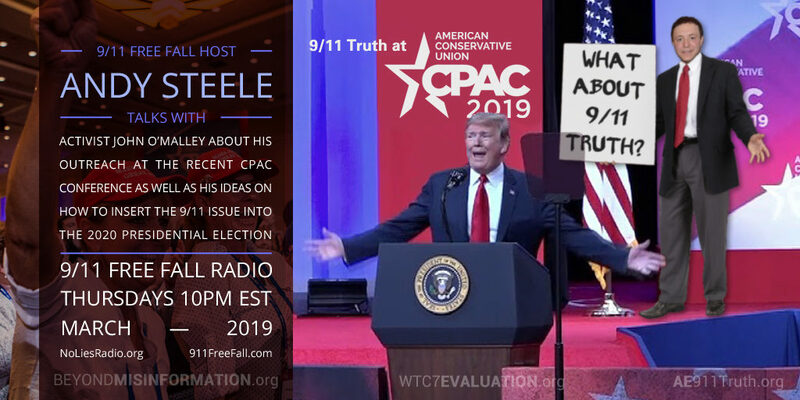 Host Andy Steele is joined by 9/11 activist John O’Malley who discusses his outreach this year at the annual CPAC conference in Washington DC, as well as his thoughts on inserting the 9/11 issue into the 2020 presidential election. 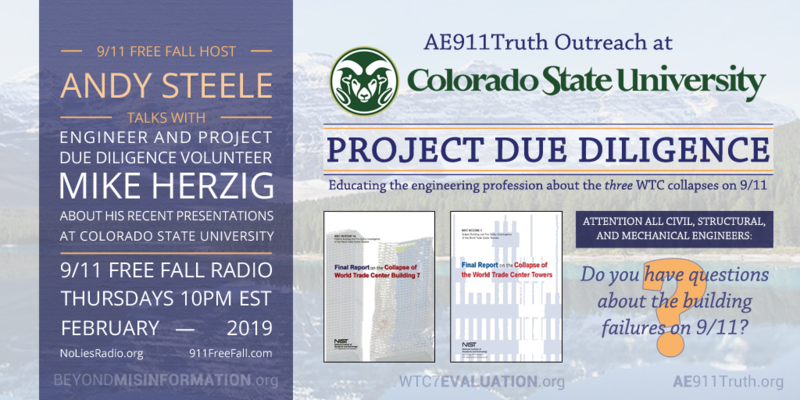 Host Andy Steele is joined by engineer and Project Due Diligence volunteer Mike Herzig, who discusses his recent presentation of the World Trade Center evidence to adult education students at Colorado State University this month. 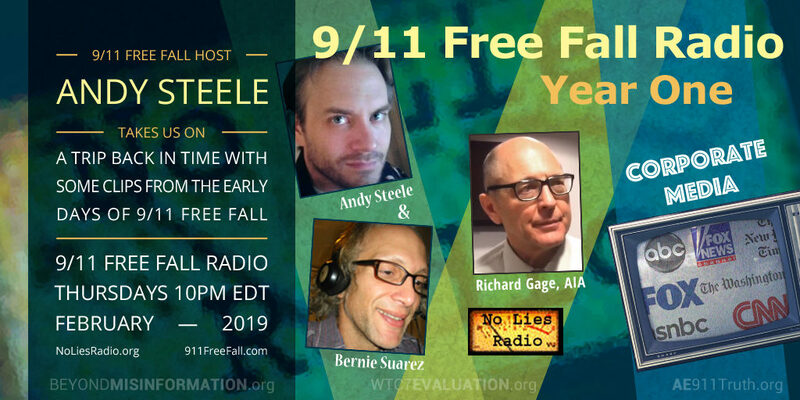 In this week’s episode of 9/11 Free Fall, host Andy Steele invites the audience back in time to 2012, when two not-yet-experienced and not-quite-ready-for-primetime AE911Truth volunteers, Bernie Suarez and Andy Steele, launched this very show. 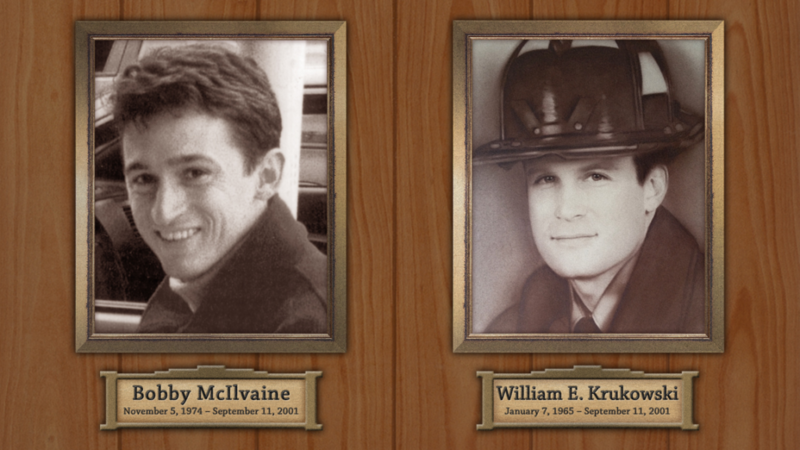 Waxing nostalgic, Andy plays clips from the first-ever episode; from AE911Truth founder Richard Gage’s first guest appearance; and from a segment in which the co-hosts first touched on the subject of the corporatized media.